“The (Christmas) holidays are the ideal time-out for me to dive into a good book. A fat and dense one, during which I do not want to be disturbed. 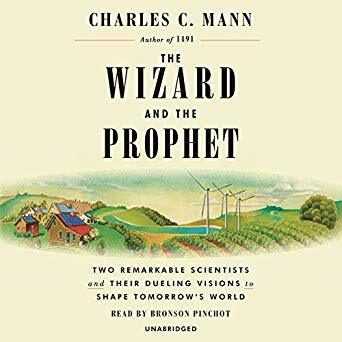 ‘The Wizard and the Prophet’ by American journalist Charles Mann had been on my list for a while. I had heard both terms during meetings at Wageningen University and Research (WUR) many times. But I still wasn’t clear on their exact meaning. With the WUR-wide dialogue session on nature-inclusive agriculture coming up, it was the right moment to find out more. Mann describes the life history of two American scientists born in the beginning of the 20th century. Two agricultural experts who each looked at the future of the planet through different eyes. Their visions seem contradictory, even irreconcilable. Or might it be possible to unite the optimism of both men? That ultimate wizard has a name: Norman Borlaug. From the 1950s onwards, he led the Green Revolution. Extensive use of fertiliser, pesticides and improved seeds enabled higher yields in agriculture, but also lead to damages to soil and water. The prophet is William Vogt. In the 1940s this ecologist warned about hunger, disease and war that could strike if populations and prosperity kept on growing. He inspired many and became the founder of the environmental movement. My father continued his working life in agriculture, focusing on food production and agricultural trade and industry. Both in the Netherlands and in international projects, including in the former Soviet Union. He did this with an almost sacred belief in technology. Retrospectively I now consider him a classic ‘wizard’. I am a child of the end of the 20th century. Infected with the sustainability virus from the end of the 1980s onwards and with a rather romantic pendant for small scale initiatives and going back to nature. Even so, it only really hit me at the beginning of this century that, although we of course can (and have to) work hard to combat poverty, our planet is the source of life on earth. If we destroy her, there will no longer be a place for us. I recognise the prophet in myself! Mann himself doesn’t pick sides. At first sight, he seems to be on the team of the prophets. He lives in an energy neutral house and recycles his water. But through the challenges of the continuously growing population and technological advancement, he feels more and more connected with the wizards. His book is a successful attempt to explore both directions. The entire narrative reads like an exciting adventure book. Like the lively description of the production of the natural fertiliser ‘guano’, produced by birds on an island off the coast of Peru. Or the desperation of Borlaug when he has to transport Mexican wheat samples to Pakistan and India, exactly at the moment when both countries declare war on each other. The book is about more than agriculture alone: food, water, energy and climate, it can hardly be more topical. It is filled to the brim with terms and names, which dizzy the reader at times. But the illustrative descriptions of the life and emotions of both scientists mesmerised me until the end.